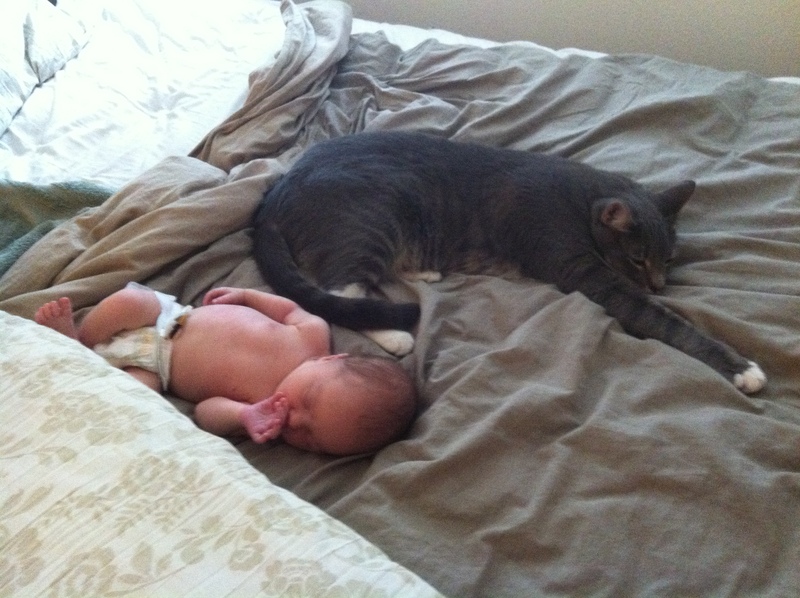 I’m just an innocent baby, napping with the cat. Nothing to see here. Before having kids, I assumed certain aversions were instinctive: poop, vomit, dead things… You would think we naturally stay away from anything that smells gross, right? Even our pets avoid their own poop. But parenthood has taught me that our fear of germs is learned. I’m guessing enough adults shriek in horror when they see their adorable pink-cheeked babies squishing cat vomit in their chubby hands that kids eventually get the idea. When I was giving my friends the latest incident report, one of them told me about how she was at Target one day when she saw her two-year-old eating a lollipop. She asked her, “Where’d you get that?”, and her daughter grabbed her hand, walked her over and pointed to the lint-covered spot on the floor where she picked it up. “Kids are foul,” my friend confirmed. Yup. They will eat their boogers and paint with them. They will even politely offer you some. They will scrounge for old, dried food from the car’s floor board and highchair safety net. They will chew rocks. They will dump their lunch into their milk then try to drink it. My daughter was obsessed with eating paper for a while. She would look through her books, select a suitable page (what criteria she was using, I have no idea), tear a long paper strip off the page, then start chewing on it. She would eat napkins, paper towels, and toilet paper. Worried that she was deficient in something (apparently some food cravings come from nutrient deficiencies), I researched paper-eating and was relieved to find out that it is a very common childhood behavior and is relatively safe. Still, we tried to discourage her but she would chew books on the sly, along with toothpaste. She had a toothpaste addiction for a bit. Anytime she had the chance, Brontë would grab the toothpaste tube and run away, squirting as much toothpaste into her mouth as she could before we grabbed it back. We had to keep all the toothpaste hidden–you’re not supposed to eat toothpaste, it says so right on the tube! One time I was changing her crib linens, however, and found a contraband tube of toothpaste hidden under her stuffed animals. Foiled! I have no clue how she got her hands on one, but she was sneaky enough to hide it for later use. This just proves that no matter how vigilant you are, your kids will occasionally eat something nasty.